Trunch is the largest of the villages between North Walsham and the sea; but as all the industrialisation and tawdry caravan sites are hard against the coast, and Trunch is several miles inland, it has avoided these excesses and retains a great rural charm. It has a magnificent church with lots of fascinating treasures, as well as a shop, a green, a pub run by an ex-professional footballer, and generally all the typical features you expect to find in a large village in deepest rural Norfolk. 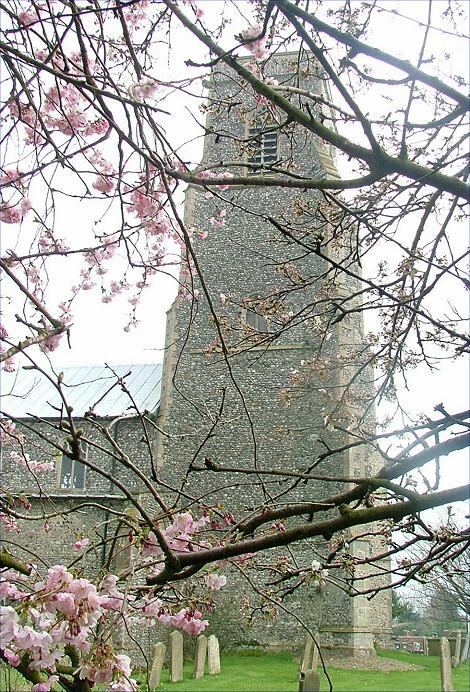 The church is perhaps the most interesting of all round about; and, while the large village lends it an urban quality that lacks the charm of, say, the churches of neighbouring Edingthorpe and Crostwight, it has by no means the Victorianised sterility of those at Bacton or Happisburgh. St Botolph is a big church, and its tight graveyard makes it rather hard to photograph. The whole piece seems to have been rebuilt in the early 15th century, although the chancel may be a little later, and there is a hint of Decorated about the nave. The tower is quite simple, even slight. It builds boldly enough, but at the top of the second stage fades into a simple bell stage, understated, elegant and probably intended. This is not a building that shouts at you. A curiosity is the massive priest porch surrounding the door in the chancel. These are very unusual, although there is another, smaller one at neighbouring Knapton. The great treasure, of course, is the marvellous font canopy. It is particularly fascinating because of its date, coming in the early 16th century right on the eve of the English protestant reformation. Like all church furnishings at this time - the tombs at Oxborough, for instance - it gives us a hint of what the English renaissance might have been like if it had been allowed to flower. Here, the massive structure tumbles with intricacy; fruit and flowers, leopards and lions peep around the silvery oak of the six octagonal columns which are fluted with interlocking chains of detail. The glory is the massive crown of canopied niches, with the haunting ghosts of crucifixion groups still apparent on three of the faces. The whole thing is at once in perfect harmony with the west end of the church, but exists because it was believed to be beautiful rather than known to be useful.There is only one other font canopy in Norfolk, at St Peter Mancroft in Norwich; Outside of the county there is another at Durham Cathedral, and a fourth at the parish church in Luton - but that is it. 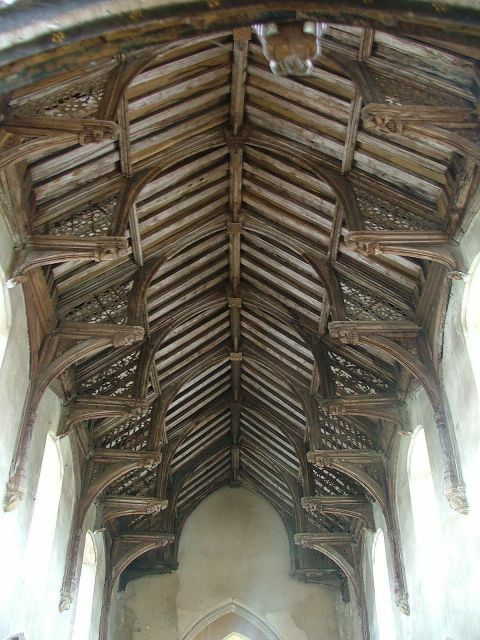 Above the canopy is a rich 15th century hammerbeam roof, by no means as dramatic as that at nearby Knapton, but more beautiful, I think. In the space beneath the tower there is what appears to be a gallery like the plough guild gallery at Cawston. This is not as elaborate, but its oak has silvered and it is painted beautifully with trailing rose foliage. The benching, unfortunately, is pretty much all 19th century, but along with the font canopy and roof the medieval screen survives. Like the canopy, this is richly ornamented in relief, including a bold dedicatory inscription in diagonal ribbons across the top part of the dado. The twelve figures (11 disciples and St Paul) are boldly placed and coloured, but their faces have been completely vandalised by the 16th century reformers. 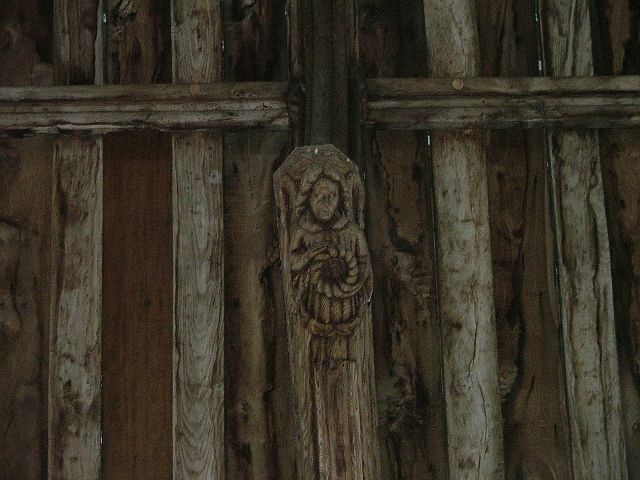 Low down on the north side of the doorway is a rare surviving carved consecration cross, suggesting that this screen was already installed in the newly built church of the 15th century. The screen had detached buttressing running vertically at intervals in front of it, as at Ludham. They have been almost entirely destroyed, but you can still see the fixings between the panels. It must have been magnificent. The return stalls in the chancel are pretty much all Victorian, but they retain medieval misericords, and also you can see quatrefoil holes set into a sounding chamber to amplify the singing. There is a very curious memorial above the priest door, featuring the instruments of the passion. I have no idea how old it is. All of these features would be enough, but part of the attraction of St Botolph is the sense of harmony, the way everything works together. You can add to these the sedilia, the magnificent organ, and the modern design of the glass in the east window. It is a peaceful, inspiring space. Cottages and houses hem in the graveyard, and in the corner is the modern pub. Incidentally, I don't really know if the bloke who runs it is an ex-professional footballer. But, like many rural Norfolk landlords, he seems to be a cheerful 40-something cockney who serves a decent pint and cheap food - a recommended stop for churchcrawlers.